I had the pleasure last weekend of participating in a story time for military families on Fort Drum. Tell Me a Story is a program hosted by the Military Child Education Coalition and is intended to promote literacy and, according to the MCEC website, to “empower Military Children by using literature and their own stories in a way that fosters skills for resilience, strong peer and parent connections, a sense of pride and accomplishment, and a caring community.” You can find out more about this program here. It was my second time serving as a facilitator for a Tell Me a Story event, and I can’t wait until the next one comes around! My fellow facilitators and I wore our 1940’s best to set the mood for Mercedes and the Chocolate Pilot, which is a true story about shared hope and joy during the West Berlin Airlift. Listening to the story itself was fun, but facilitating was the real joy of my day. 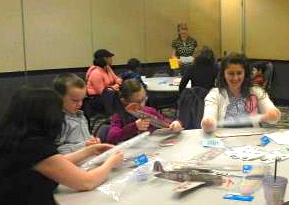 We made foam airplanes and discussed themes like giving and generosity. The families at my table had children from toddler to middle school aged, so we had a good range of ages for conversation. We talked about small ways we could help others in our daily lives that would make them feel cared for and appreciated. We put ourselves in Mercedes’ place and discussed how we would have felt if we had very little to eat and were worried about our family. I encouraged the children to suggest what they would most want the pilot to drop to them if they were in Mercedes’ situation. They came up with wonderful ideas–books, a game to play with family, and, of course, chocolate to share! We also made tiny parachutes to which we attached miniature chocolate bars while we discussed things we could share with people that may make them feel as happy as Mercedes felt when she got her package from the Chocolate Pilot. Many of the ideas the children shared were about acts of kindness they could perform–and that they would never run out of those like you can run out of candy. Our final activity was to each receive a card with two pieces of gum on it, one piece for us and one piece to share. We talked about who we would share our gum with, whether they would be surprised that we were sharing, and how fun it was to share even “little” things like gum. I am excited to participate in the next Tell Me a Story event that comes to Fort Drum because this program represents a wonderful opportunity to connect with families while flexing my teacher librarian skills. It doesn’t get much better than working with families to go beyond the basics of story reading to story exploring and communicating feelings and new ideas. Unless of course there is chocolate! Chocolate makes even the best event better.